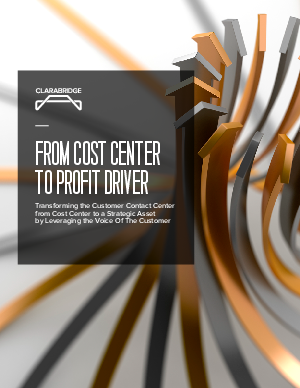 The customer contact center, while typically viewed as an important component of an enterprise, also tends to be perceived as a cost center and, therefore, a target for cutbacks. From a more short-term perspective, these cuts make sense. However, companies that adope this strategy are missing an important opportunity to reposition the contact center as a Voice of the Customer center that collects customer feedback across all internal and external channels, and transforms it into actionable insights that companies can leverage to gain a significant competitive edge. Leveraging VOC enables companies to identify and resolve problems before they become widespread and broadly affect customer satisfaction. Listening to VOC also allows companies to stay in tune with customers' evolving needs, wants, and expectations; and to keep the growth of products and servces aligned with these changes. Download this paper for a 5 step roadmap that can be used to reposition your contact center as a VOC center.